Oct 31 Is Anything Too Hard for The LORD? Genesis 18 begins with the LORD appearing to Abraham, again, but this time was different from the previous times. We are not sure how God appeared to Abraham on Genesis 17 but we know that Abraham responded by falling on his face (Genesis 17:3) as discussed on our previous post. Before that we read how the Angel of the LORD found Hagar (Genesis 16:9-13 discussed in more detail on this post). On Genesis 15 we have the word of the LORD coming to Abraham in a vision, and on Genesis 13:14-17 the LORD speaks to Abraham. If you have been following our series you realize the whole thing began with the LORD speaking to Abraham and calling him out of his country and family (Genesis 12 discussed in more detail on this post). I share this to highlight God's interest in having a relationship with Abraham. We do not read about Abraham desperately seeking God in search of special blessings, instead we read about God initiating and maintaining a relationship with Abraham. On our journey through the Bible so far we have met a loving God who is very interested in developing a relationship with His creatures. The way that the LORD appears to Abraham in Genesis 18 however is very different from Abraham's previous encounters with the LORD. Many believe that Hebrews 13:2 is referencing the events described in Genesis 18 and how Abraham entertained angels, and the LORD Himself. The text tells us that Abraham lifted his eyes and saw three men standing by him (Genesis 18:2). There is some debate regarding how aware Abraham was from the beginning regarding the identity of the strangers who came to visit him. The Biblical text places Abraham and the strangers by the terebinth trees of Mamre. Some will argue that the mention of the trees link this story to Genesis 13:18 to an altar and worship, and this could mean that Abraham was expecting a visit from God. The argument is that the writer is intentionally linking this event geographically to a place of worship and this would mean Abraham is expecting a visit from God, perhaps he had been praying about it. According to the text, this encounter took place "in the heat of the day" (Genesis 18:1). Many agree that this is traditionally "siesta time," when people withdraw to the shade. This is not a time to be outside, especially in the desert. Abraham, however, is not inside the tent taking a nap as we would expect, instead he is "sitting in the tent door" almost as if he is expecting someone to come. This detail regarding the time of the day and Abraham's behavior also support the idea that Abraham was expecting God to appear. As you read through Genesis 18 it is interesting to notice how eager Abraham is to please his guests. Abraham ran (Genesis 18:2,7), hurried (Genesis 18:6) and asked Sarah to quickly make (Genesis 18:6). Not bad for a man who was ninety-nine years old and had just been circumcised (Genesis 17:24). Abraham seems very intentional about making his guests feel comfortable as soon as possible, which continues to raise the question of how aware he was of their heavenly origin. When Abraham says literally "in your eyes" he uses the second person singular. This is where the King James Version can be helpful since it differentiates between "thy" which is singular and "you" which is plural. Why do I bring up this detail? Because Abraham is speaking to the One he calls 'adonay (literally my lords). But if Abraham had in mind several people while saying 'adonay then he should have used the plural "in your (plural) eyes." So I can't say for sure how aware Abraham was about the true identity of his visitors, but I believe there is enough textual evidence to argue he might have had an idea that at least One of these strangers was not just an ordinary stranger. Sarah is listening to Abraham talking with the strangers from inside the tent door behind them and she heard "the stranger" (the LORD) say that she would have a son. I really don't know if Sarah had any idea of who was talking to Abraham, but her reaction is the same as Abraham's in Genesis 17:17, she laughs. I made the references to Abraham and Sarah's age bold to help you see how intentional the author is about highlighting the fact that they were both very old. It is interesting to note that Sarah laughs "within herself" (Genesis 18:12) and she was behind Him, yet the LORD is aware of her laughter. The LORD is aware of even Sarah's reason for laughing within herself. "‘Ah, Lord God! Behold, You have made the heavens and the earth by Your great power and outstretched arm. There is nothing too hard for You." Do you think it is too difficult for God to cause a woman beyond child bearing years to have a healthy baby? 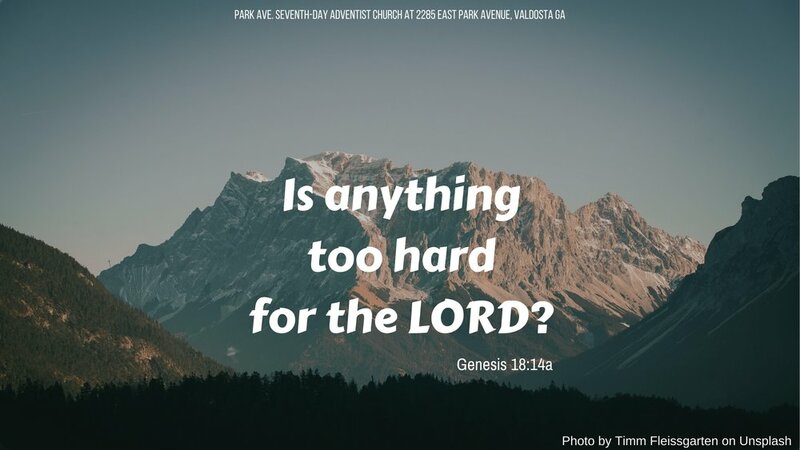 Do you think it is too difficult for God to help you in your current situation? Do you think it is too difficult for God to save you? Jesus spoke these words after His interaction with the Rich Young Ruler. Many people I talk to seem to understand this passage to be talking about the challenges for a rich person to be saved. I believe this passage is talking about salvation, regardless of one's financial or social status. The culture of the time indicated that the rich and powerful were the ones most loved and clearly blessed by God. If you were rich and had a high social status you were surely saved. Jesus said it was impossible for the rich to be saved. The disciples are shocked and wonder if anyone can be saved. Jesus clearly teaches that it is impossible for a human being to save herself. Ultimately we all need God, we cannot save ourselves, even the highest elite, the holiest most educated, wisest, wealthiest on earth need God's grace and mercy just like any child or the worst sinner. It is good news indeed that with God all things are possible!